Even the absolute best food isn’t necessarily memorable, all of the time. Yet food that does standout as being memorable, is not always remembered for the right reasons. A combination of the two, however, is an extraordinarily rare occurrence. From hundreds of dishes sampled over the past two years, less than half of my top ten most memorable dishes have been particularly desirable. Most, in fact, have been so deplorable, so utterly grotesque they’re borderline offensive. At the top of the pile, there isn’t a Psychotherapist qualified enough to emancipate me from memories of one particular Party Ring biscuit-shaped appetiser I’d half expected to be quite pleasant. Instead, this sphere of saccharine white chocolate harboured a whopping portion of raw, fermented sturgeon. These puerile memories of unexpectedly eating an assortment of ingredients so repugnantly discordant and impossible to swallow, will eternally keep me awake at night. The food at Rabbit on King’s Road, however, is some of the most memorable I’ve sampled this year, but it’s also been some of the best, thus far. 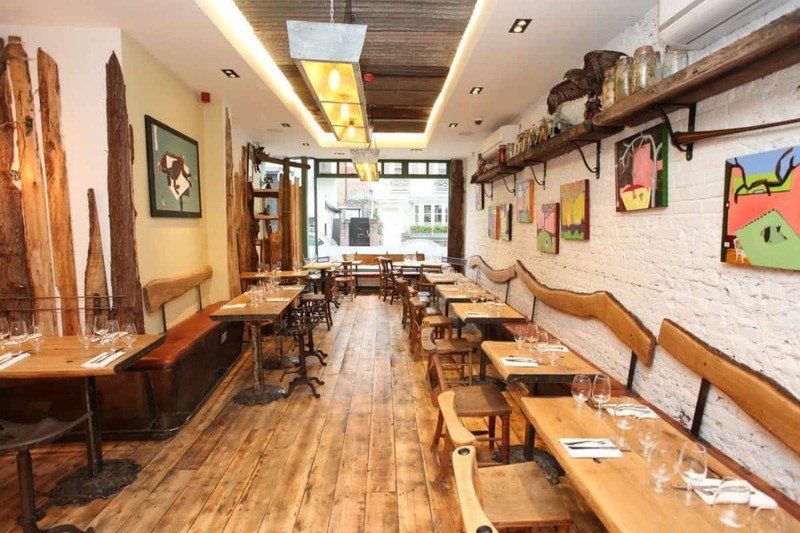 Part of the Gladwin Brothers’ growing West London empire, Rabbit is the second of three restaurants (including The Shed and Nutbourne), occupying a space near Sloane Square, which seems deceptively small from outside. Like Nutbourne, the brothers’ most recent opening, the interiors here have a rustic charm that makes diners feel as though transported into the countryside, miles away from the city. Rough wood tables are joined by bench seats, bold, brightly-coloured paintings and just enough hunting ephemera to amplify the tone of the menu without channelling a pompous deer stalking lodge. At lunch, an astonishing amount of natural light floods the L-shaped room, even when it’s raining outside. As for the food served, most of the produce is “wild food”, having either been hunted or foraged. Oliver Gladwin is on hand during our lunch visit, having just returned from a foraging trip to Battersea Park, sporting a pair of trainers that make him look as though he’s recently returned from Glastonbury Festival. Though Rabbit is the second of three restaurants from the Gladwin’s, there are no tell-tale signs of under-loved middle child syndrome. To start, a selection of small canapés that have clearly endured hours of preparation are quickly guzzled in mere seconds. It’s the fact that they’re remembered, however, that really counts. A beetroot crisp has natural sweetness heightened by the addition of pear gel but tamed by some whipped, lactic goat’s cheese. ‘Brown Crab Bomb’, on the other hand, is a marble of crab meat and dulce seaweed that’s breaded and fried. Though somewhat slicky, the clean freshness of the crab meat still shines through. Better, though, is a fragment of crisp bread which seats a cluster of confit pheasant strips that celebrate the game bird in a remarkably flattering manner, but best of all is the mushroom marmite éclair. I absolutely adored the mushroom marmite at Nutbourne, against all odds, and here it is piped into a sphere of choux pastry, crowned with a silky confit egg yolk. Like the most savoury, umami profiterole – this is one of the better dishes I’ve tasted this year (possibly ever, in fact). Another inventive dish, pearl barley risotto is cooked slightly al dente and flecked with flutters of shredded turkey neck and smoked cheddar. The use of turkey is surprisingly pleasant, given the bird’s reputation for being dry as a camel’s tongue, though the cheddar does make the dish taste somewhat claggy. Lulworth scallops are perfectly cooked, seared on the outside with golden caramelisation yet soft inside, and teamed with brackish shards of chicken skin, apple puree and black pudding – a classic scallop accompaniment. Apart from the fact that everything on the plate is properly cooked and prepared, what’s most impressive about this particular dish is the way in which the apple cleverly tricks the palate into believing that it has been treated to more pork than in reality. One of the simplest dishes tasted, a carpaccio of chestnut mushrooms, is also one of the best. Paper-thin slices of mushroom are prettily fanned out across the plate then topped with crumbled goat’s cheese, plus a smattering of chilli and Alexander (Roman pepper). In addition, the minimal implement of some truffle shavings complements the dank, earthy taste of mushroom, but without being overly pretentious. This is the sort of dish that demonstrates flagrant signs of a good chef. There is nothing that could be removed or added to this dish to make it taste any better. Tempura monkfish, on the other hand, favours the cheeks and makes good use of an otherwise less-exciting fish. Although highly-prized and generally expensive, monkfish is one of the meatiest sea creatures, but it’s also one of the blandest when it falls into the wrong hands. Here, two plump cheeks are dredged in a light tempura batter and fried. Instead of being greasy and tasting of little more than oil from the fryer, the cheeks have an astounding depth of flavour which is coaxed even further by the additional aioli with a subtle hum of saffron. Disregarding the mushroom marmite éclair, the best dish eaten at Rabbit is the whole wood pigeon, presented at the table then taken away to be carved. Joined by a sweet onion puree, cutting through the bird’s rich gaminess, the pigeon is coated in seeds and cooked with such due care and attention, such precision that even Morrissey might approve. The seeds add a pleasant crunch, yet the flavours are subtle and don’t over-ride the flavour of the bird that’s cooked so perfectly pink then peppered with a meagre pinch of ground liquorice root. We finish with a shared dessert which combines two of my favourite puddings: rhubarb and custard, and a prettily stacked mille-feuille. Four sheets of thin puff pastry are adorned with intricate blobs of rhubarb and set custard, accompanied by the occasional raspberry and a generous sprinkling of crushed almonds. Prepared with a light touch and, again, devoid of any unnecessary ingredients – the dish is naturally splendid. As well as removing diners from the hustle and bustle of central London for a couple of hours, the food at Rabbit showcases a tremendous amount of skill and (even more importantly) an infinite sum of care. Celebrating such eminent produce teamed with a deep knowledge of complimenting flavours, the food at Rabbit is, mostly, without fault – enough to sate even the most difficult of diners. Rabbit can be found at 172 King’s Road, London, SW3 4UP.